Have you seen a sky scarf in action? Totally new to me idea that somehow said, “you must try this for 2012”. 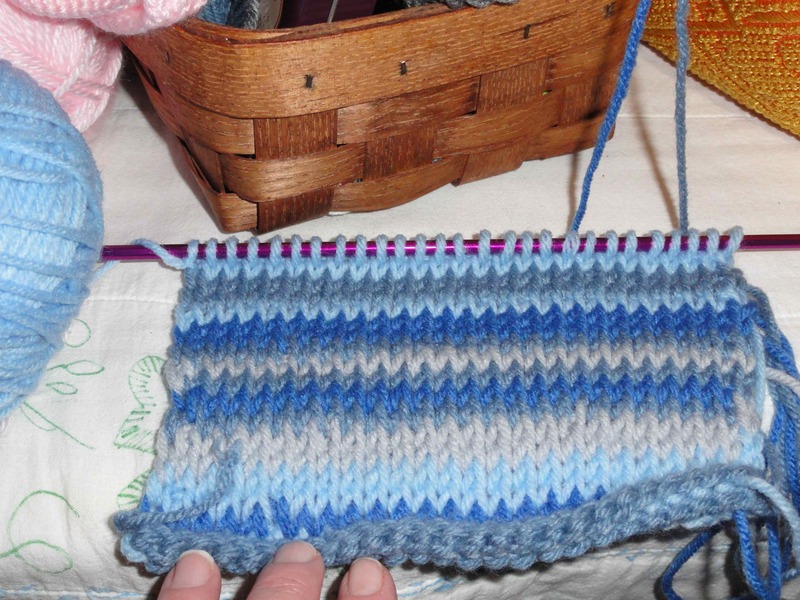 And because for the first 4 days of the year I tried to knit and let’s just say EPIC FAIL, I am doing this in Tunisian knit stitch with an afghan hook and 3 shades of blue and a grey. I may add others, but this seems to be enough colors to match the sky just about every day. I’m not getting technical here, just ball-parking it. Since right now it seems that Wednesdays will be the wool-eater updates, I am thinking I will be updating my progress on this scarf on Fridays. I just KNOW y’all wanna see how it looks every week with a whopping 7 rows of new stuff added. Like it is soooo important to show you how the sky has looked in western Iowa for the week. 🙂 OK ~ no need to squeal ~ maybe I’ll just do a post every 3rd or 4th Friday instead. And somehow, I just think 365 rows will make it a TAD longer than I really need it to be. Maybe I’ll stop somewhere around September…we’ll see. if you do join me, I really and truly expect links to your stuff in the comments 🙂 on Fridays too! Oh, and btw ~ the penny arcade jacket has been done for 3 weeks or so, but my photographer is a slacker and hasn’t helped me get it ready for posting. And also btw ~ it feels like an EPIC FAIL as well. You will probably laugh as hard as I did when I put it on for the first time. I’ll share it this weekend if I can get him to pick up the damn camera and show me a little love. This is fascinating to me – I can both knit and crochet, but I’ve never attempted Tunisian anything! Does the back of your scarf look like the back of ‘regular’ knitting too? Congratulations! I enjoy visiting your blog so much, I have given you a Liebster Blog Award. You can read more about it ‘here’, in my blog, alottastitches. And now I guess I need to begin working on my own list of Liebster-winners! Best to you ~ cheers! Hm, I need to pick up my abandoned Tunisian crochet project (my kids tangled all the yarn together and it made me so mad, I just stuffed it in a bag). The sky scarf idea is actually pretty cool. I wonder how many shades of gray yarn are out there to replicate the Pacific Northwest sky… :p I’m considering it; I’ll let you know if I do it! I’m trying to start this project, but sort-of new to crocheting and feeling overwhelmed. Can you offer advice for how to switch the colors so often in the same project? Next Next post: crochet:: the penny arcade jacket…?